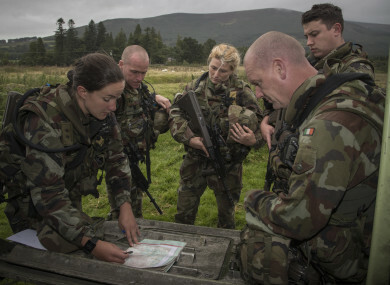 THE DEFENCE FORCES have launched a new recruitment scheme. Defence Minister Paul Kehoe announced the new Permanent Defence Force (PDF) general service recruitment competition yesterday. The recruitment scheme is aimed at honouring the Government’s commitment to keeping the strength levels of the Defence Forces – which includes the Army, Naval Service and Air Corps – at 9,500 personnel. In total, the forces are seeking to recruit 800 new personnel across all services this year. Commenting on the most recent recruitment campaigns, Minister Kehoe said that this general service recruitment campaign will “build upon the successes of previous campaigns from which it is expected that just over 800 new personnel will have been inducted into the Permanent Defence Force by the end of 2017″. “As this will deplete existing panels, it is now appropriate that we initiate a new campaign in order to provide for the induction of further personnel in 2018,” he said. Kehoe also spoke about the importance of having young people serve in the Defence Forces. He noted, following recent increases to pay, that “on completion of recruit and three-star training, which takes an initial 17 weeks followed by a further 12 weeks training respectively, newly qualified three-star Privates and their Naval Service equivalent can expect minimum gross annual earnings of €27,000″. Applicants for the General Service with the Army and Air Corps must be 18 years or older and under 25 years of age before this round’s closing date of Friday 27 October. Applicants for General Service with the Naval Service must be 18 years or older and under 27 years of age before the closing date. Recruitment for the general enlistment is already underway. People can apply on military.ie. Email “On the hunt for a job? The Defence Forces have launched a new recruitment campaign”. Feedback on “On the hunt for a job? The Defence Forces have launched a new recruitment campaign”.